The Provincial Nominee Programs (PNPs) of Canada has been in news in the year 2017, in view of their immigration target and busy schedule. The Immigration Refugee and Citizenship (IRCC) has put special emphasis on the PNPs of Canada and enhanced the immigration target for these provincial immigration programs to 51,000 for this year. This has resulted in the lots of activities within different Provincial Nominee Programs of Canada, which includes, streamlining the process, the introduction of new streams, launching the online application process to make the increased application intake smooth and trouble free, etc. Provincial Nominee Programs are a key part of Canada’s immigration system. These programs allow the different provinces and territories of Canada to choose the new immigrants for their respective provinces, by implementing the own eligibility parameters, keeping in mind the local labour market and economy. 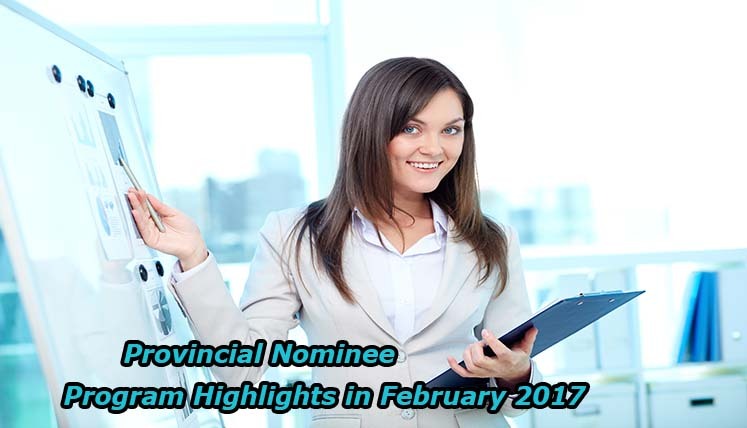 Let’s take a look at the key Provincial Nominee Program Activities in the month of February. Ontario had a busy schedule throughout the month of February. It reopened its three key streams on February 21, 2017, i.e. Express Entry-Human Capital Priorities Stream, International Student— Masters Graduate and International Student— PhD Graduate stream. Ontario government also launched the online application process for all these streams, which was a new feature added to OINP application processing. The Express Entry-HCP stream is the quite popular stream among the skilled workers looking to get permanent residency in Canada. The British Columbia is another key province in Canada that had the busy schedule last month. Its key PNP, i.e. British Columbia Provincial Nominee Program (BCPNP) invited 1260 individuals to apply for Provincial Nominee Certificate via its three different draws in the month of February 2017. Out of the total invitations, 1232 were for the express entry and skilled immigration streams of BCPNP, while the rest were issued under Entrepreneur category. The invitations issued by BCPNP are basically for applying for the Provincial Nominee Certificate and not the permanent residency. Candidates who apply for nominee certificate and obtain the same can apply for permanent residency in Canada. The one unique aspect of Manitoba Provincial Nominee Program (MPNP) is that it issues LAA (Letter of Advice Apply) to the applicants, who have submitted Expression of Interest (EOI) in the MPNP. With the increased immigration target and key reforms, Provincial Nominee Programs of Canada will be a crucial pathway to immigrate to Canada and get permanent residency in the year 2017. If you are also looking to apply in a provincial nominee program this year, you may coordinate with a reliable Canadian Immigration Consultant for key process support and assistance. Which is the best Province in Canada to move to as a new Immigrant?